You’re always ready to grill. Platinum spatula. Camouflage apron. Secret dry rub base sourced from a South Carolina shaman. But there’s one thing you have yet to master: eliminating the trip from the grill to the table. Say hello to the Shinwa Grill, a barbecue game changer with a built-in grill, available now to expedite your grill-to-plate time. Finally, a chance to channel Benihana in your backyard. Your table: bamboo with seating for up to six. Your grill: a charcoal cast-iron slab that can stay hot for up to six hours. 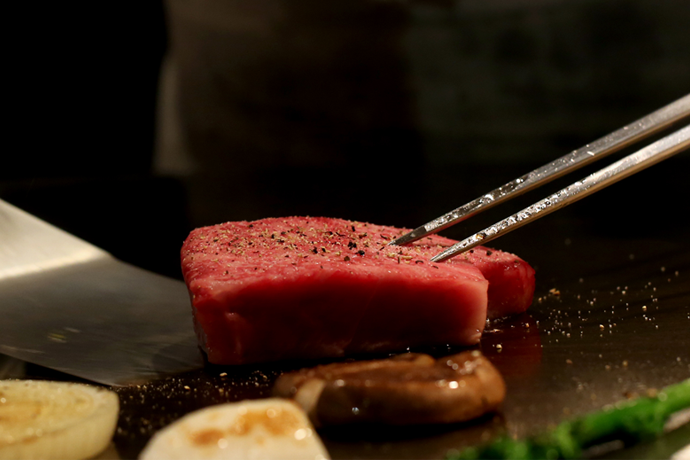 Your game plan: nonstop sizzling. Before long, you’ll be cooking up teriyaki chicken, mojo-marinated shrimp and filet tips with the balletic prowess of a kitchen samurai. 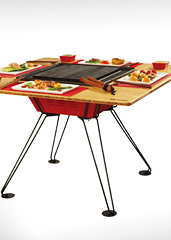 And you’ll do all this while chatting up your guests, without having to take breaks to man a separate grill station. And though the table is built to withstand the outdoor elements, it’s handsome enough for holding court indoors. Which opens up a whole new set of possibilities. Your living room has been missing an element of danger.